Compared to other hill stations, Dalhousie, 80 winding kilometers from Pathankot, is markedly different and off the beaten track. 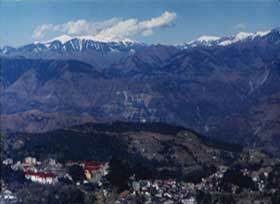 Spread over five hills, Dalhousie has a serenity with its own distinctive flavour. Attractive cottages and villas cling to the deodar and pine mantled hills of Dalhousie. Here at Dalhousie, nothing seems to matter except the beauty and the moment. Pink and red rhododendrons are in bloom. The trees are dressed in different shades of green. There is no swirl of traffic. The shops are small and trim. Whistling softly to himself, a shopkeeper arranges embroidered Chamba shawls in his showcase. Tourists appraise Chamba chappals embroidered with gold thread, cane baskets, colorful woolens, and life-like Chamba dolls  all specialties of the region. Piles of walnuts and red, black and green Chamba chilies adorn many shop fronts. We pass children joyfully picking strawberries from a hillside decorated with alpine flowers. In 1851, the princely state of Chamba was approached by Lord Napier of Magdala. The British wished to establish a sanatorium for Europeans on the outer slopes of the Dhauladhar range. There, the sun shone warmly on scented forests of pine and oak, the air was crisp and invigorating, the scenery beautiful. Negotiations were carried on with the Raja of Chamba and in 1853, the plateau of Kathlog, Portreyn, Tehra and Bakrota were transferred to the Government of India against a compensation of Rs. 2000 to be paid as an annual tribute to Chamba state. On the recommendation of Sir Donald McLeod, the new sanatorium was named Dalhousie, after Lord Dalhousie, the first British Governor General of India. In 1866, the cantonment area of Balun was also taken over and remains a cantonment to this day. Though spread over five distinct hills  Kathlog, Portreyn, Tehra, Bakrota and Balun, covering an area of 13 sq km  the main center continues to be at Portreyn. The Figure of Eight of Portreyn is the most popular walk in Dalhousie. Starting from the Portreyn Mall, it crosses the meeting places of Subhash Chowk and Gandhi Chowk. Along the rocks on the way, Tibetans have carved colorful pictures in relief. One of the best views of the glorious surroundings of Dalhousie can be obtained from Kalatope, 8 km from the center of Dalhousie. At Panchpulla (Five Bridges)  a good spot for picnics  can, if one is lucky to run into an old Dalhousie resident, be heard interesting snippets that intertwine Indias freedom struggle with Dalhousie. Satdhara has long been known for its mineral water which was once shipped to England on a regular basis. Dalhousie also has Dainkund  the Singing Hill. The passage of mountain winds through the forest at Dainkund produces a series of effects  depending on the winds velocity  ranging from a gentle humming to an eerie wail. Around Dalhousie are wealth of places which beckon those who have an eye for beauty or a nose for adventure. Khajjiar, just 7 kilometers from Dalhousie is an enchanting saucer shaped meadow fringed by cedar trees of great antiquity and stateliness. In the center of the grassy meadow at Khajjiar lies a small lake. And on it, are two floating islands, sometimes hidden from view by the tall grass that grows on them. Khajjiar, known as one of the most charming spots in the Himalayas, derives its name it is said from its ancient, golden domed temple of Khajinag. A nine hole golf course is an added attraction at Khajjiar. Beyond Khajjiar, a fascinating two hour (56 km) drive from Dalhousie, perched on a ledge overlooking the Ravi river and soaring skywards in a series of tiers, stands the historic temple town of Chamba. Often described as a jewel of the Himalayas, Chamba, 920 metres above sea level, steeped in legends and guarded by rich forests, is named after a beautiful princess  Champavati. 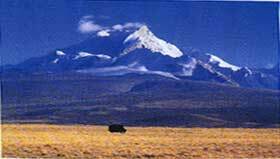 Some say that Chamba was so named because of the abundance of fragrant Champa flowers in the area. A picture of sylvan elegance, Palampur, nestling at 1269 meters in the magnificent shadow of the White Mountainsthe mighty snow covered Dhauladharsis also called Himachals Valley of Flowers. Avenues shaded by pines and cedars, hedges with wild rambling roses in red and white and pink, flowering wisterias, fragrant gardenias, sprawling tea gardens where smiling hill women deftly pick tea leaves, gurgling brooks, green gold fields of rice swaying in the wind, and stylish bungalows impart a refreshing character to Palampur, lying in the near the point where the Dhauladhars rise sheer from the Palam valley. Set like a jewel against the splendid backdrop of the legendary Dhauladhars, the spired temple of Baijnaththe abode of the Lord of Physicianscontinues to attract people from all corners of India, and the world. Built by two merchant brothersManyuka and Ahukamore than a thousand years ago, in 804 A.D., the temple of Baijnath has acquired an aura of mystic invincibility. Inside, the lingam of Vaidyanatha Lord Shiva has long been a symbol of veneration for the vast numbers who journey to this temple year after year. The temple priests claim a lineage as old as the temple. Month after month, they have observed the motley crowd of people who become unified by the sheer strength of faith as they approach the lingam. Many travel to Baijnath in the hope that the Lord of Physicians will grant a boon and free them of ailments. The water at Baijnath is reputed to possess remarkable digestive properties and it is said that till the recent past, rulers in Kangra Valley would drink only water obtained from Baijnath. The sleepy town of Dharamshala overlooking the Kangra Valley was irrevocably changed when the Dalai Lama claimed it as his residence-in exile in 1959. Although the Tibetan influence is what has made the town famous, the colorful combination of cultures in this mountainside town is what makes it fascinating. Brilliantly smiling Tibetan refugees; a tribe of cholu clad nomadic shepherds known as gaddis and reputed to be descendants of Alexander the great; Hindus from all walks of life; chanting Buddhist monks in unsewn wine colored robes; and a fresh crop of international hippies make up the 17,000 people who inhabit this hill station. Delhi is 14 hrs drive away via Ambala & Karnal.